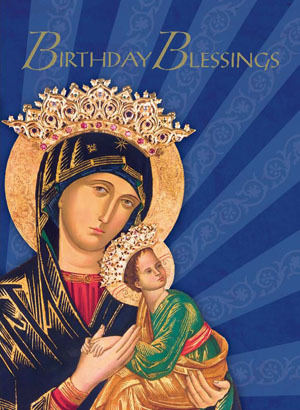 The Redemptorists » New Birthday Mass Enrollment cards available! Need the perfect gift for a special birthday? Looking for a present for someone who has everything? Why not offer your loved ones a lasting gift — weekly Mass celebrated for their intentions for one year? Our new Birthday Blessings Enrollment card entitles enrollees to be remembered during Masses celebrated on Saturdays in Redemptorist chapels and parishes throughout the Baltimore Province. The suggested donation is $10 for individuals and $20 for family enrollments. Click here to order Birthday Enrollment Cards. You can also enroll loved ones and send us your donation online here.